In just a few days, from 5th August 2017, I expect a modern day battle of Waterloo as passengers at Britain’s busiest railway station fight for carriage during a period of “significantly fewer trains” when platforms 1-9 will be closed so work can start to extend those platforms for longer trains. 202 years ago, somewhere around where Belgium is on the map today, the Emperor of the French, a man who is immediately known by the use of the word Napoleon, was defeated by the Duke of Wellington at the Battle Waterloo. Those not around in 1815 may refer to the 1974 Abba song, although I think ‘surrender’ has a somewhat different meaning on the battle field than it does in the song “Waterloo – knowing my fate is to be with you”. There’s a bridge over the Thames named after Waterloo (the battle, not the song) and, in turn, when the London and South Western Railway opened a station in the area in July 1848 it was named after the bridge, in fact Wikipedia says it was originally called as ‘Waterloo Bridge Station‘. 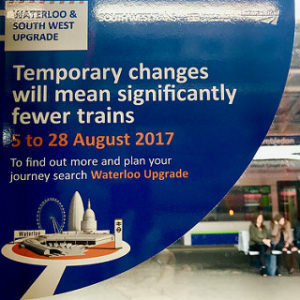 In just a few days, from 5th August 2017, I expect a modern day battle of Waterloo as passengers at Britain’s busiest railway station, now referenced in your station guide as London Waterloo, fight for carriage during a period of “significantly fewer trains” when platforms 1-9 will be closed so work can start to extend those platforms for longer trains. Appropriate emoji’s at the point are a happy face for the prospect of longer trains and the scream for the next 23 days commuting experience. That’s basically half the platforms closed at a station where 100 million journeys start or end every year. Even though work has been planned in the summer when — hopefully — there are marginally fewer commuters that’s still a big hole to fill. If you’re already standing with your nose in somebody’s armpit on a morning peak service, the promise of “Services and stations will be busier than usual, especially in the morning and evening peaks on weekdays” is probably pretty depressing. For some months, Adecco (“the largest staffing firm in the world”) have been advertising for Crowd Control officers to support the “blockade project which will positively transform the journeys of millions of people”. A nice spin on, what I imagine, will be a fairly thankless task to keep commuters calm: trains and stations have been plastered with signs warning of reduced (or even, no) service for most of the year but I can already see the Twitter outrage from those who did not get a personal visit for a member of engineering team. If you use expensive noise-cancelling headphones on your morning commute you may be forgiven for having missed the non-stop announcements warning of the works. The rest of us don’t have an excuse. There will be the usual frustrations of people failing to get somewhere important — or standing around somewhere else for a long period of time, waiting — but I don’t see how any of this is avoidable. Maybe I should make the month off. Of course, after all this work is complete we are promised capacity for 30% more passengers during the busiest parts of the day when 100,000 people pass through the station. The trouble is, in the 24 years I have been in London passenger numbers on these lines have more than doubled, making Waterloo the busiest transport hub in Europe. That’s a more-than 100% increase over that time. If that growth carries on at a similar rate then the extra space, which we’ll probably already fill, will be also be bursting in 6 or 7 years. These works are making a better use of existing infrastructure but what options do we have beyond that? 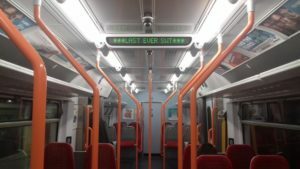 Where will new trains go in 24 years from now? All in all seems like a sensible time to have applied to run the trains into a half-closed station, don’t you think? A picture triggered a rather clear flash back to 1994 and one of the first times my name ever appeared on the internet. I’m on a short work-related visit to New York. It’s hot here. But, for once, not as hot as London. You know what they say about mad dogs and Englishmen? Well, today, sometime just after my lunch I went to the roof of our office building which has had a fancy new terrace installed. It was lovely. And very hot. I didn’t stay there long. 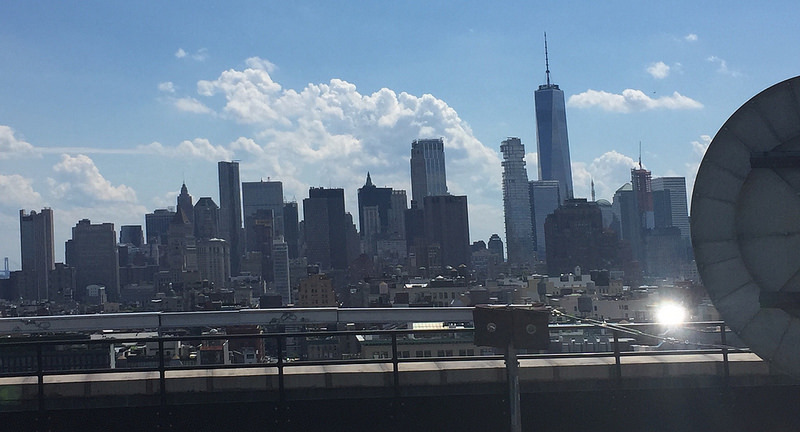 You can’t, however, stand atop of a New York roof and not take a picture. So I did. Reviewing these pictures moment ago, this picture triggered a rather clear flash back to 1994 and one of the first times my name ever appeared on the internet. I don’t recall who wrote it, it’s gone forever from the internet archive, but it was a sarcastic comment about my online collection of pictures of satellite dishes at British radio stations. There was a reason they existed. I worked for the company who owned the dishes at radio stations and we had a collection of photographs so that you could describe to an engineer where the dish was if they needed to point it back at the satellite after a pigeon had flown in to it (which actually happened). On the night shift one day I decided to share the pictures with the world on the corporate www. At some point it was deemed inappropriate to house the pictures on the website of the company that owned the dishes. So I bequeathed them all to James Cridland’s MediaUK directory where, for a few years, the image was linked to the radio station’s entry. I found the Red Rose picture in the internet archive. For this one, you really didn’t need a picture to describe to an engineer where the dish was. Although James credited me on the pictures, I actually took none of them. They were all taken while I was locked in the control centre overnight (which – and it amuses me daily – was located about 15 paces from the front door of the London office building I work in today). A little like counting the rings on a tree, you can age somebody who grew-up in 1970s Britain by the main television characters they reference. 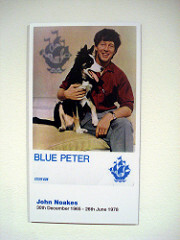 John Noakes, Flickr, by Si Wilson. In Radio Reflections I wrote about how, when I was growing up, the media landscape was very different than it is today. A landscape of fewer channels means that, like counting the rings on a tree, you can age somebody who grew-up in 1970s Britain by the main television characters they reference. For some it might be Zammo or ‘Gripper’ Stebson in Grange Hill. Maybe a little later it would be Scott and Charlene in Neighbours. But, I think, for most of my generation the real telltale dating come from your Doctor (mine was Tom Baker) and your Blue Peter presenters. For me, Lesley Judd, Peter Purves and John Noakes were Monday and Thursday television. Throughout the time I watched, John was always accompanied by Shep, described as ‘an enthusiastic border collie’. Shep & John went everywhere together: they really were a double act. Noakes was known for his catchphrase, “Get Down Shep” but I wonder if it really was uttered that often? I think you pass from famous to national treasure in Britain once we’re able to take have a little fun with you. For John Noakes, he may already have been a National Treasure before The Barron Knights released Get Down Step, but this cemented that status. I also saw Guardians Of The Galaxy Vol.2 which is very different. There’s one part that’s still amusing me 24 hours later. I saw a couple of films over the bank holiday weekend. 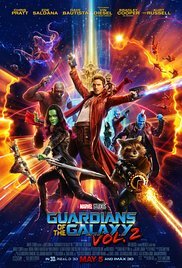 Guardians Of The Galaxy Vol.2 is a great sequel, with plenty of amusing lines, and a 70s and 80s ‘awesome’ mixtape that, of course, works better in the film than when you play the soundtrack at home 24 hours later. I don’t think it’s a spoiler to say that, towards the end of the film, there’s a quick reference to a little device from 2006/7 that, amusingly, fewer people in the cinema seemed to recognise than “Brandy (You’re a Fine Girl)” by Looking Glass, which dates from 1972. A few of us here might remember it. After 32 years on the air, there’s still something special about BBC Local Radio in Shropshire. As I post, it’s still St. George’s Day: just. According to Wikipedia, St George rose to the position of the primary patron saint of England during the English Reformation. I didn’t see many references to St. George today, but I think most people across the country were thinking about the dragon rather than the Pope’s control of the Church in England. 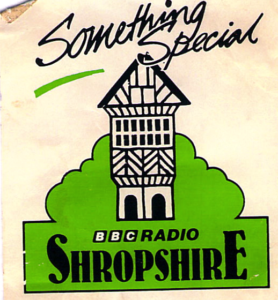 If, however, you live in Shropshire – or you are a radio historian of some kind – you’ll know of today as the 32nd anniversary of the launch of BBC Radio Shropshire. I am not sure that I would have mentioned it here accept for the fact that a few weeks ago I found an old cassette with copies of the pre-launch test transmissions from 4th and 9th of April 1985. I am sure that there’s lots that you can learn from those test transmissions but, what I find most fascinating, is that Radio Shropshire’s first voice, Diane Kemp,1 repeats the postal address in almost every link. The phone number is mentioned but, of course, there was no text, email, tweets or Facebooking. A few years later, one of my first jobs was answering the telephones for the afternoon shows on the station: regularly speaking to the characters that made up the county. It was the primary way to be part of the station, we’d call it interaction today. It definitely shows that our interaction with radio stations has changed massively in 32 years. A few years ago I wrote about changes to the Shropshire Radio landscape, when Signal 1o7 launched and Beacon was re-branded to Free Radio, and pondered if bigger names were a blueprint for the 21st century: giving smaller stations a recognisable brand. Today, I remain convinced by the theory but, when I last listened to either of those stations in Shropshire, the key bit missing was anything about the county. Given Signal 107’s audience share is less than 2%,3 and Free Radio’s share in Shropshire is around 9%,4 have those brands lead to a reduction in local content which, in turn, means listeners tuning out? Or, is it purely a matter of increased competition? BBC Shropshire’s audience share is around 13%5 but I am not sure how to read that. Is local content important to audiences. Certainly, I would hope that Ofcom recognise that BBC Local Radio may be the last bastion of substantial amounts of local information on the radio. Isn’t the licence fee there to support content the commercially-funded stations can’t afford to? I think that’s what makes local radio interesting. I hope Ofcom manages to keep it that way. Happy Birthday BBC Shropshire. 3 December 2016 data, media.info. Total survey area for Signal 107 is greater than Shropshire. 4 December 2016 data, media.info, former Beacon Shropshire area. 5 December 2016 data, media.info. Through London in the early morning: did somebody fall asleep with the light on? Who’s awake at this hour? The day’s first light has not quite made it above the horizon but the dawn sky says it’s coming. The city’s suburbs are stretching themselves awake from their slumber. I’m travelling at just the right moment: the morning’s engines have not quite started and the only thing slowing me down are the red traffic lights on the way, mainly stopping me for imaginary vehicles or invisible people. Yet there’s light all around, but it’s artificial. As the morning yawns, announcing a new day, all the lamps seem unnecessary yet turning them off would make it feel nighttime eerie. There’s a strong pulsating white headlight from a bike coming down the hill; a cyclist adorned in orange high visibility. You can’t miss it although the beam might be blinding. As we cross over the bigger highway with empty lanes waiting for the morning rush, there’s the throb of an orange warning light sitting atop of a recovery van while more people in high visibility scurry to attach a vehicle to the back. Travelling through the suburbs there’s a momentary flash of emergency blue from a police car but I have no idea why he’s pulled-over, alone, on the side of the road. There are lights in the block of flats to my left but, with curtains drawn, any movements are invisible. Did somebody fall asleep with the light on? Who’s awake at this hour? There’s a lamp in a hotel room creating a shadow of arms dressing – no curtains, but more anonymity. Passing an office block, the lights of the third floor illuminate in a sweeping movement ahead of a shadowy figure with a machine sweeping the floor in preparation for the arrival of the worker’s feet. There’s a fully-lit supermarket with lines of lifeless shelves waiting for the day’s first shoppers and the dancing movement of a man and a mop. And there are more shops, partially lit, yet locked-up to all: their night-lights highlighting a small portion of the retail space, with a focus on the empty cash-registers, seemingly saying ‘there’s nothing here’ while lighting the wares. Every car we pass has a brightly lit dashboard that’s announcing the route or the currently playing track. The mid-80s music playing from the easy-listening station is more alive at this time of the morning than it’s been at any point since it was originally heard 30 years ago. 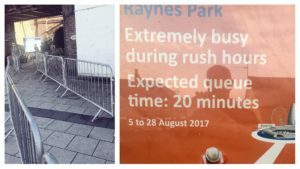 There are a couple of people at the bus stop; their faces lit by a combination of the countdown screen announcing the next arrival and the faint glow of the mobile screen. The white headphones suggest music accompanies their journey too. As time ticks by we drive in the opposite direction to the arriving bus. It’s empty now, I can see the security screen taking a continuous picture of unoccupied seats. I know the automation will be announcing the stops to nobody except the driver. I wonder if she’s listening – checking she is running to timetable – or if the repetition of the ‘next stop’ and ‘stand clear of the doors’ has rendered her deaf to the voice. We speed past a group of young people; laughing. Those of us that remember that mid-80s music the first time wonder if they’re coming home or leaving for the day. Where do the pretty young things go at this hour in the middle of suburbia? The idea of an early-morning house party seems at odds with the neat driveways and solar-powered garden lights of this part of town. I see the smiley face of the speed-check sign showing we’re travelling within the allowed limit: the language of the smiley and the emoji is more from their generation than mine yet the sign is aimed at me. A digital sign-face that provides a reminder that, even in dawn’s first light, the machines are still watching us. And through the tunnel to the airport: a tail-back of traffic through a strangely uniform light beneath the ground, emerging, after just a few minutes, into the crisp, bright morning light. The sleek glass buildings reflect the early morning rays as the morning finally wakes. Yet the purple glow of the airline’s colours can still be seen high in the vaulted entrance through which I pass into a different world. For the next few hours it could be day or night. Inside the terminal it can be hard to tell what time the sun-dial might show, but, finally, time has passed and we board. For once there’s a blue and cloudless sky through which we climb, seemingly, towards the burning, never dimming, rays of the sun. This day is newly born. Do you trust a digital lock? Do you trust programmatic advertising? Did anybody ever believe anybody would write that sentence? Sermon Of the Last Sunday (#SOLS) was introduced with on-target delivery: the 2017 Reading challenge and the first Japan retrospective. Then I got the calendar wrong – thought March had an extra Sunday – and now find myself writing March’s installment in April. But that’s a technicality and I’m not letting myself get too concerned with that level of detail. But what to write about? 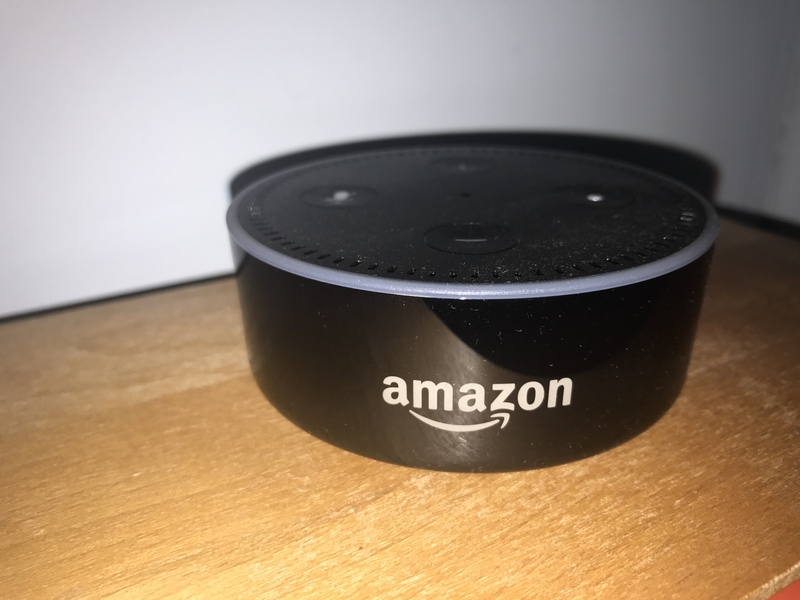 Although I vowed not to write too much on this site about the technology of digital advertising, it seems that industry news in March is worth mentioning. If I was still writing those ‘Last Week in Digital Advertising‘ round-ups then I’d have plenty of material. What made this month’s headlines big was because the news involved Google. And they always make a good story (and then they’ll index it and let you find it again too). But digital has changed everything else: advertising of all types is easier to buy for many more companies; there are thousands – if not millions – of smaller publishers where people spend time and the so-called ad-tech industry has developed hundreds of new technology ideas that sit between the advertiser and the publisher (so many, that the world they inhabit is known as the Lumascape, after the company who tries to plot them all). This Lumascape uses technology to make the process of buying and selling across so many different places both easier and more efficient by automating as much of the process as possible. Increasingly, this automation means that the advertiser (who is the buyer) relies on a machine to decide where to buy. Publishers, both old and new, connect their advertising business to these automatic buying machines in the hope the advertiser actually spends money with them. It’s a process that’s been termed ‘programmatic advertising’. The problem for many advertisers and publishers is that the details of ‘programmatic advertising’ are something of a mystery: for the advertiser they can’t be 100% sure where their advertising will show up and for the publisher they can’t be 100% sure who is advertising on their sites. Do you have a connected digital lock on your front door? My guess is that for the odd person that reads this, the answer will be no. Technology has not gained sufficient trust. The problem is, in the modern advertising world, the technology struggles to gain trust from all sides of the market but most people still have to use it. Advertising can no-longer stick with the old-fashioned key; it relies on the digital lock. The issue is easy to explain: there’s more and more Internet stuff that people are reading and watching and there’s almost no way for a human being at one of the big advertising companies to have vetted everything out there. And, because the machines have taken the job of deciding which advert goes where, we need to trust the machine to do the right thing. And sometimes, they mess-up. And, occasionally, they mess up in a very big and public way like this. The issue is complex for advertisers: companies need to be seen where their potential customers are but, in an increasingly fragmented media world, that means that they sometimes end-up down the wrong alley shouting that you should buy their stuff. The issue is incredibly hard to fix: I can’t imagine the world will go back to the Mad Men era where the buyer and seller not only both know each other and eat a lovely lunch together, but also play golf, go and get drunk in a downtown bar and take each other on expensive ‘days out of the office’. One decision the machine never has to make is if it should be a green olive or a twist of lemon peel in the Martini. Those things will all continue as long as the humans are involved but it represents much less of the advertising that is bought and sold today. Google hasn’t been singled out here but they are the top story for a couple of reasons. First, advertisers found their ads in the wrong places where they knew Google was responsible. This is reasonably important because, in some cases, the middle men of the Lumascape are so intertwined and wrapped up in a programmatic advertising mystery that the advertiser doesn’t always know which technology provider to shout at. And, secondly, as I already noted, Google is big so it impacts a lot of advertisers and a lot of money. Thirdly, Google also makes headlines which means we all notice and people like me get to write 1383 words on the topic. But, as much as the industry might wish Google to take the heat; the issues raised apply to almost everybody involved in making machines buy & sell advertising. The advertisers that have taken a stand against Google and other forms of programmatic advertising will come back. Perhaps, their agencies will pay a little more attention to the technology and the controls that are available today. The publishers will do a better job of classifying the content so that it’s a tiny bit easier to spot the places where they should not be running advertising. But, in the end, it will continue to be about the machines. The automation of traditional roles is increasingly common; the removal of some of the people in a process is not unique to advertising (this is just today’s biggest story). The machines will get trained a little better and become a little smarter in managing all this in the milliseconds they have to make a decision. But in advertising, as in many areas, the machines are here to stay. Perhaps it’s good news for real people. The machines have a lot to learn and, until they do, we’d all be wise to reconsider if we should be using a digital lock or just going for a drink with the local locksmith. I didn’t even get to the other big digital advertising story of March. Maybe that’s already material for another Sermon. Sermon Of the Last Sunday is my attempt to ensure that there is something published on my site every month in 2017. You can read about my attempts to force myself to write or review the full #sols collection through the handy site tag, sols. 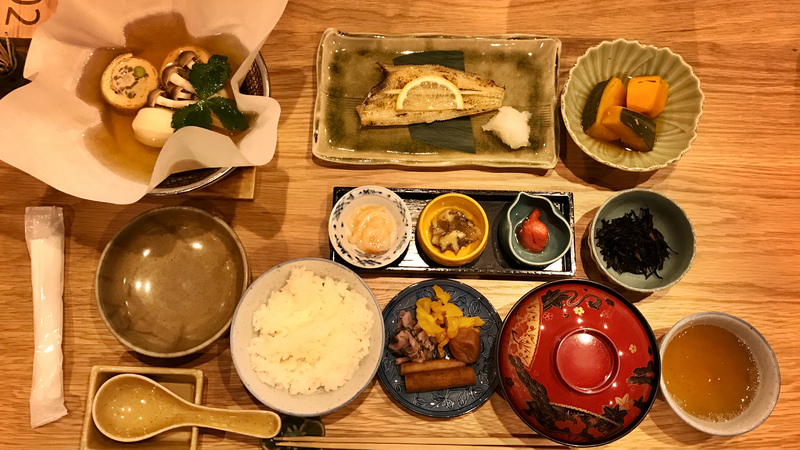 A second collection of words and pictures that sum up my 2017 visit to Japan. In this part, I get to ride the bullet train. 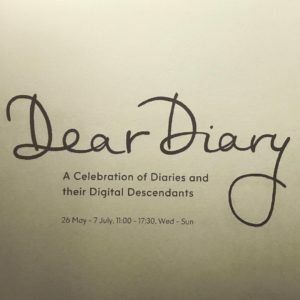 Yesterday, as part of my #sols project, the sermon was the first part of my personal Japan holiday retrospective which covered my initial week in Tokyo. If going to Japan had been a goal of mine for many years; riding the bullet train was a second aim and was a real highlight of the trip (even though you are really quite oblivious to the fact that the train is travelling at 162mph). That train, or Shinkansen as they are known, is part of a high-speed network that covers the country and runs – almost exclusively – on dedicated high-speed track. As a consequence trains are not delayed by other kinds of rail traffic and, generally, run to time. The phrase ‘to time’ Japanese-style seems to mean to the exact minute rather than the rather looser British version meaning ‘within five minutes’. The Saturday lunchtime train took us to Kyoto for the second part of the Japan experience. We returned to Tokyo to spend the last day at Tokyo DisneySea; which really is a very different world. I love travelling by train. There’s something inherently fascinating about locomotives, carriages, tracks and the networks that are formed from these things. So, I’ve always wanted to ride on the world’s original high-speed network: Japan’s Shinkansen. It’s amazing to think that trains that could reach speeds of 130 mph were introduced back in 1964 for the first Tokyo Olympics. I measured 162 mph today on the Shinkansen to Kyoto. Who knows what speeds they’ll reach for the next Tokyo Olympics in 2020; a line using maglev technology is already under construction and maglev trains have set the world record at 375 mph. We rode the Hikari service on the Tōkaidō Shinkansen which runs through to Shin-Ōsaka & Okayama and is, apparently, the most heavily-used high-speed train line in the world. 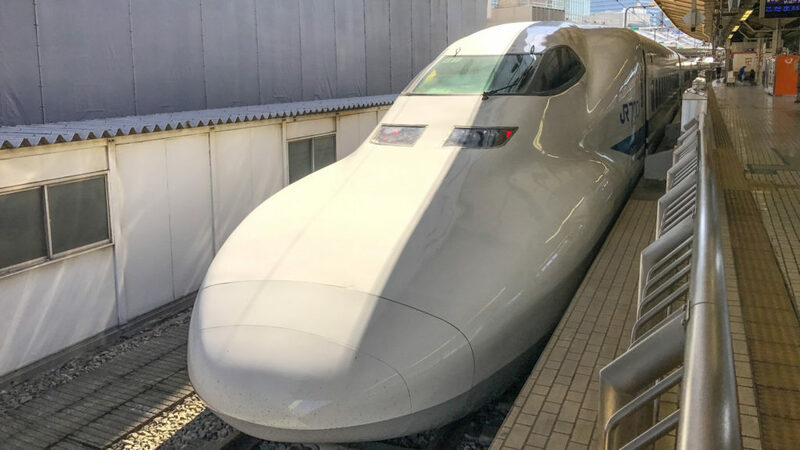 Hikari is the fastest service that accepts the Japan Rail Pass (which makes using Shinkansen much more affordable) so we lingered at some stations while faster Nozomi services passed on the dedicated high-speed lines. Amazing to think that the only thing that could delay our train was an even faster train. No delays on Chessington South stopping services or leaves on the line here. But the running speed isn’t the only fast things about the trains. The turnaround time for our train today was less than 15 minutes after the set had arrived into the platform at Tokyo central station. Waiting patiently at a space for each door was somebody to clean, turn all seats 180 degrees to face the direction of travel and place new headrest covers on each seat. The efficiency of the teamwork is a sight to behold. The bow to the boarding passengers a pleasing part of the culture. Apparently, Shinkansen changed the way business was done between major Japanese cities by making day trips possible where they hadn’t been practical before. I wonder if we’ll ever see similar between London & Scotland? A Shinto shrine houses the spirits that are worshiped in the religion. As well as the dead, the spirits could be forces of nature or elements of the landscape. There are many sub-words for Shinto shrines in Japanese but the English language only has the one. At the base of the Inari mountain is the Inari shrine; Inari being the spirit of commerce and industry (and also of rice). 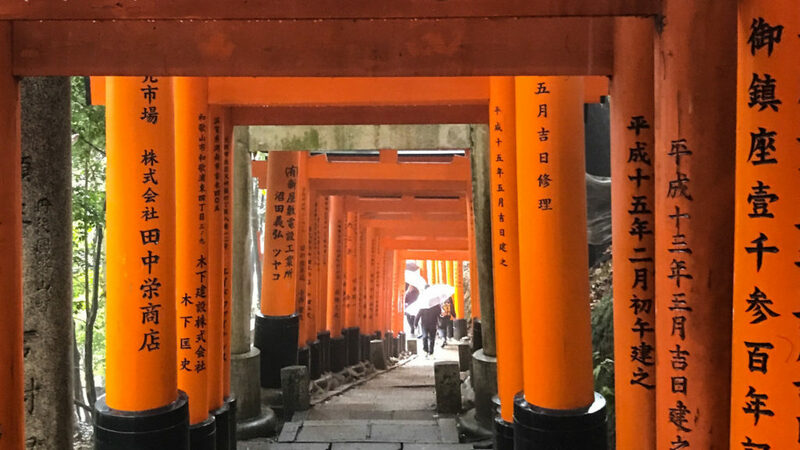 There’s a 2 hour hiking trail up the mountain, from the base at the main shrine, where you climb up through thousands of orange Tori that have been donated by Japanese businesses. On the accent the gates posts appear bare orange but on the decent you see the names of the companies that donated the Tori. It’s quite simple but also remarkably clever. I don’t know if it works as advertising or not. Conveniently located near a railway station, this temple gets busy. But as you climb the crowd thins out. There are hundreds – maybe thousands – of small shrines on the way up. And a few shops and resting places. We made it about an hour up before deciding that we should head down to see some more of Kyoto. In a city of temples this one really stands out. If my memory serves me well, you should brew a Yorkshire Tea teabag for between 4 and 5 minutes. You can leave it in the mug infusing until it’s a good strong ‘proper brew’. At work, I use the timer on my watch to make sure I brew for enough time otherwise it’s too weak and somewhat pointless. Not so with the Japanese Way of Tea which takes a good ten minutes of ceremony to get to the first cup, and is served without milk or sugar but, generally, with some kind of sweet food immediately before the drink. Using the Matcha green tea we’ve been enjoying throughout our trip, The Way of Tea is a quiet, thoughtful process of precisely using the tea-making implements (linen cloth, tea bowl, ladle, caddy and the whisk) to prepare the perfect cup (70 centilitres of water at 80 degrees Celsius). Apart from memorising the correct sequence and placement of the utensils, whisking the Matcha powder with the water correctly to prevent bitterness is a real skill. 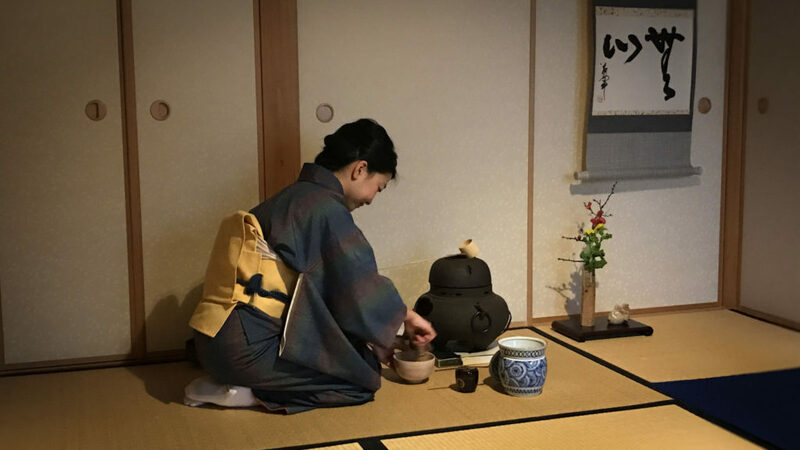 Hanging scrolls and flowers decorate the room and the host, perfectly attired in traditional kimono, pays respect to both the tea and the invited guests who, in turn, reciprocate with appropriate bowing. Apparently, following the preparation of the tea there’s polite conversation where controversial topics are avoided and the chatter is more about the heritage of the tea-making equipment. Mastery of The Way of Tea, learnt in special schools, can take ten to fifteen years but, in the end, what you get is a beautiful art form and the perfect cuppa. I was expecting Japan to feel stranger, more alien to me, than it turned out to be. I assume this is because Tokyo is a major world city that exhibits the characteristics of such a sprawling urban mass: and that turns out to be quite familiar. Plus, many of the signs are in recognisable (and, therefore, easily readable) Roman characters and there’s a Starbucks wherever you turn. Kyoto was a little different; a smaller city with narrower streets, what seemed like a temple on every street and, it seemed, more people in traditional dress. It was also the place we stayed in a more traditional Japanese Inn, a ryokan. 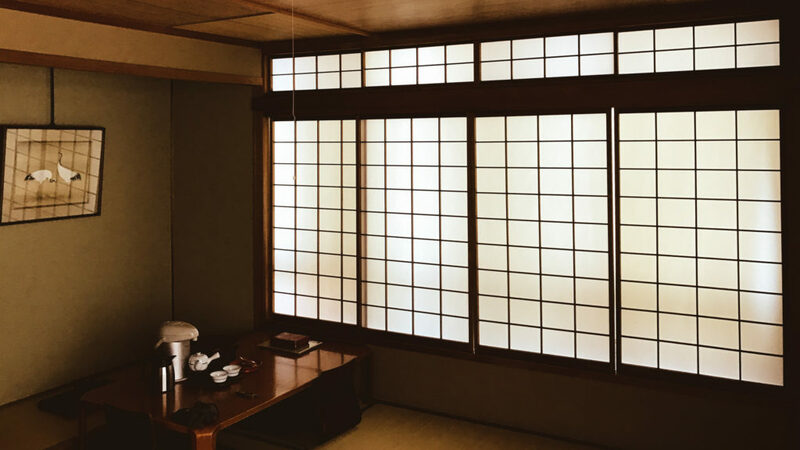 Although I think the one we stayed in was straight out of the 1950s rather than 1650, it was simple with a tatami-matted room, public bath and basic facilities (if you count air conditioning and wifi as basic). Sitting on a cushion on the floor, sleeping on a mattress rolled onto the mats & drinking green tea is probably a tourist stereotype but it made for a different way of doing things and was unlike any hotel I’ve ever stayed in. I’d recommend it: even for a few days, if your knees can cope. When planning the Japan trip, there was a full day in Tokyo following the return train journey from Kyoto and before the flight home. Somehow, and I am not sure I recall how we came to this decision, we decided to visit the Disney parks in Tokyo. In many ways this was an odd thing to do. Disney is the undisputed global king of the theme park but, surely, the experience is identikit and it would be a waste of a day that could otherwise have been used for more authentic local experience. In the end I am glad we did. Aside from being quintessential Disney there are some subtle differences that we would have missed if we’d done something else. Plus, of course, it’s a theme park with enough rides and queues to fill several days. There are two parks, Tokyo Disneyland, which I imagine is from the ‘how to build a Disneyland’ manual. 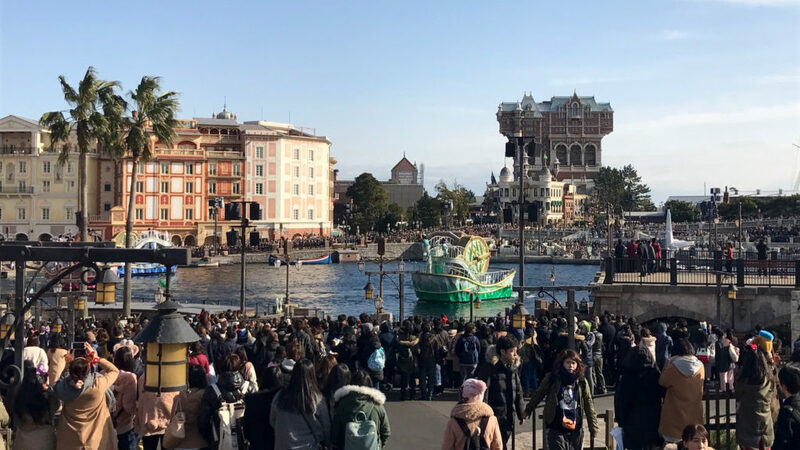 And the nautical-themed Tokyo DisneySea which, according to its Wikipedia entry, was the fastest theme park in the world to reach the milestone of 10 million guests. Apart from the fact that Disney doesn’t have another park like this one (although many of the major attractions do appear in other places), the most subtle difference can be seen the enthusiasm of the guests for all the Disney characters; for some reason I noted a lot of Donald Duck fans. And this is from visitors of all ages. It would be natural to expect the kids to jump with joy with an unexpected Chip & Dale encounter but not so much their fathers. Almost everybody was wearing a Disney character about their person; there’s a factory somewhere churning out thousands of pairs of Mikey ears for each day. And what makes it most interesting is that the enthusiasm is infectious. It really is a happy place. A fun ending to an amazing trip. The first pictures from my trip were posted yesterday. I think there’s another couple of Japanese posts: a summary and my Instagram pictures. All to come. Bringing together my impressions of Japan in words and pictures: the first week was spent in Tokyo. Looking at the calendar I see we are already at the last Sunday in February which means it’s time to fill your timeline with the hashtag #sols once more: Sermon Of the Last Sunday. It’s my attempt to write something new each month on my site (although, a few days ago, I felt the need to write Will The Internet Kills Television?). Apart from fulfilling my #sols need for February, today I am also keeping my personal site commitment of maintaining a copy of things I post elsewhere. Two #sols birds with one #sols entry. At the end of January I took a holiday in Japan. Japan, and particularly Tokyo, was a destination that I have always wanted to visit but it’s taken until this year to get there. I was not sure what to expect: would everything seem radically different from life in London or would it maintain the familiarity of a big city? As always when on holiday, I took a lot of photographs. Increasingly, these are taken on a phone which is both portable and has many other uses aside from pictures (in Tokyo, having constant access to Google Maps was enormously helpful when trying to navigate a big city). Having all the photographs accurately time and geo-stamped on a device which makes uploading easy is another significant advantage. I decided that each evening I would review all the pictures I’d taken and post a single image that summed-up the day to an album on Flickr. It’s a little Japan vacation retrospective. I also decided to post a different kind of picture each day to Instagram. Combined they might make a small, but hopefully interesting, summary of the visit for me to remember and for others when researching Japanese holidays. I’ll post the Instagram pictures later in the week but this is my Japan collection. However, I am dividing the pictures into 2 parts. Week one was primarily Tokyo and the second week was Kyoto. Photo of Day 1: Godzilla through the years. Movie posters in the lobby of the Hotel Gracery, Tokyo. There’s a large Godzilla climbing the outside of the hotel. Photo of Day 2: Meiji Shrine in Shibuya, Tokyo. 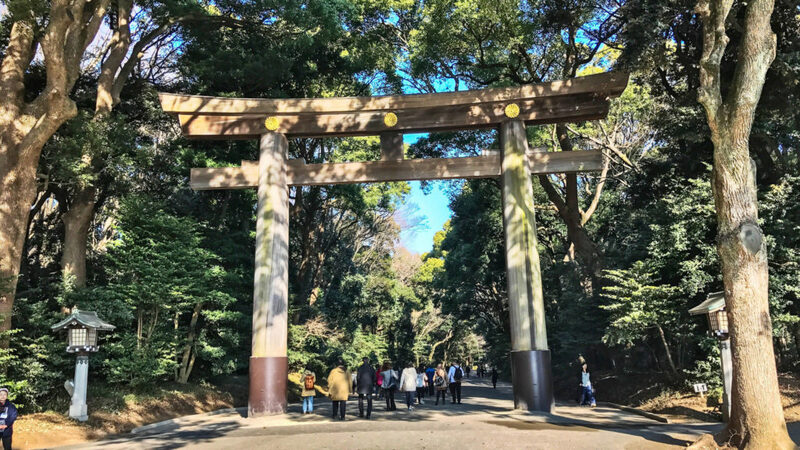 A torii, or traditional Japanese gate, at the entrance to the Meiji Shrine in Shibuya, Tokyo. This Shinto shrine is dedicated to the spirits of Emperor Meiji and his wife, Empress Shōken. An amazing forest of 120,000 were donated by people from all across Japan when the shrine was built. It’s simple, peaceful and very relaxing. There is beautiful simplicity to the architecture and the more religious customs. 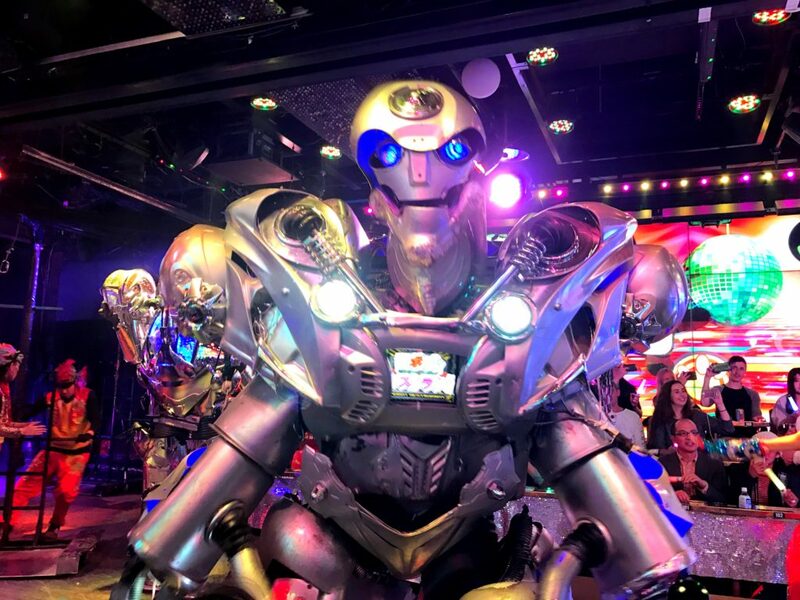 Photo of Day 3: A robot at Robot Restaurant, Shinjuku. For some reason whenever I think of Japan I think of robots doing useful stuff. We haven’t found any of those yet but we have found the most bizarre cabaret show, The Robot Restaurant, where the hostesses walk around the room – boxing ring style – with signs asking you to turn off your Bluetooth and wifi enabled devices for fear of interference with the controls for the show. Ironically, most of the ‘robots’ are people in costume but there are some remote controlled participants in this video-game inspired 90-minute strobe-lightathon. There are no words to describe the craziness which seemed entirely appropriate in this neon-lit district of the city. After the Robot Restaurant’s bought what it needed, the fact that there’s any neon left for the other venues is really a modern day miracle. Standing 12,388 ft, Mt Fuji is the highest peak in Japan; a World Heritage Site and, apparently, still classed as an active volcano. 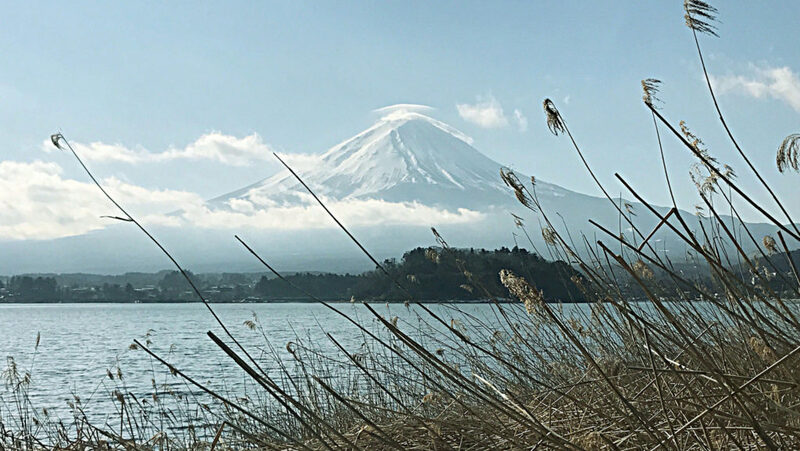 It’s snow-capped peak has become a symbol of Japan, which I imagine, is something of what makes it attractive to hikers and climbers. According to our tour guide the climbing season starts in July and officially ends in September but he wasn’t recommending anybody attempt it after the end of August. Given we were all quite happy in our heated, wifi-enabled coach, I’m not expecting to see any of my fellow tourists climbing next season. We got got as high as 2020m (of the 3776m which make up the aforementioned 12,000 or so ft) before the road was closed due to recent snow falls. Still, the air was crisp, the sun was out and you could see the peak. It’s quite an impressive sight, although at the 4th station it’s the surrounding peaks you’re looking at rather than the one immediately above you. There also seems to be an annual photographic competition which might help explain the abundance of stunning images of the mountain on the internet, as well as the large number of people carrying tripods & camera bags around the tourist locations. My picture may not be up there with the greatest but it’s all mine. Taken at the first tour-stop, Lake Kawaguchi-Ko, one of the “five lakes”, it was our first proper Mt Fuji sighting. When they said you never forget your first time, perhaps it was views of Mt Fuji they were talking about. Yes, I’m sure that’s right. Covering an area of 1.32 sq miles the space was, during the height of the 1980s Japanese property bubble, valued to be worth more than the sum of all of the real estate in California. So, it’s decent bit of land to own. 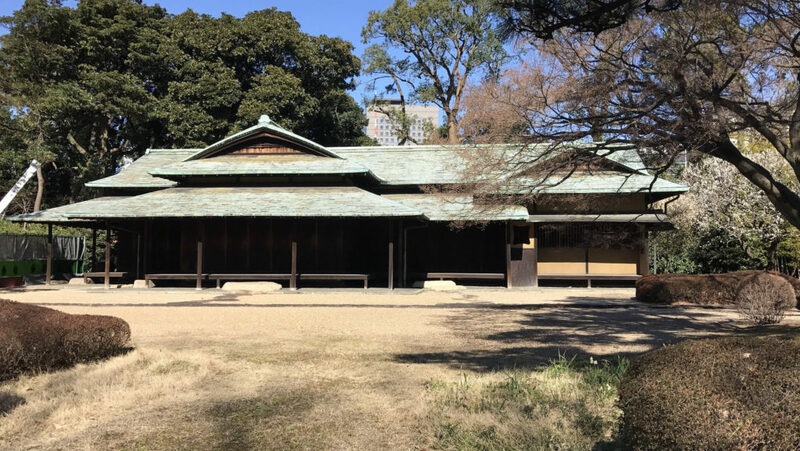 It is the main residence of The Emperor of Japan as well as home to a bunch of the kind of administrative offices needed by the ceremonial head of a nation. Unlike, say, Buckingham Palace which you can stand in front of and photograph, it seems quite difficult to get up to The Emperor’s front door. There is some kind of limited daily tour – conducted only in Japanese – that visits some non-public areas but I can’t tell you about it because we didn’t do it. However, the East Gardens are open to wander around and are a fascinating collection of horticulture, including areas given over to cultivating roses, tea, bamboo and a plot of land where trees representing each of Japan’s 47 prefectures have been planted. There’s an area called Cherry Blossom Island which, I imagine, will be amazing in a few months. Surprisingly, at least one tree was in bloom but it stood out against the bare winter branches of most of the plants. Towards the end of your wander around the gardens, if you follow the route suggested in the free map (and why wouldn’t you? ), there’s a 18th century Japanese garden complete with running water, pool and wooden bridge. Around the gardens there are examples of guard houses, a museum and a beautiful example of a tea house (pictured). There’s also a late 1960s concert hall and buildings named Gakuba and Shoryobu on the guide (which house some of the aforementioned administrative offices; for the Music Department & Archives Department). All-in-all, a place of beautiful, traditional tranquility in the heart of modern Tokyo. Open from 9am if you’re interested. Some reports suggest that Tsukiji Fish Market is the largest wholesale seafood market in the world. I can’t vouch for that but it could take several hours to walk around the stalls of all the intermediate wholesalers. Although, as a sightseer, you don’t get several hours. The inner market is open to tourists from 10am, by which time most wholesalers are packing-up & the professional buyers have taken their fish away to be served-up across the city. That’s not to say there’s nothing to see; just most of the selling is over for the day. If I was being strictly accurate, the market is open to 120 sightseers from about 5am if they were to have queued through the night to see a portion of the frozen tuna auction. Our guide wholeheartedly recommended not bothering and, anyway, you can’t watch the fresh tuna auction. I’m not entirely sure why. Apparently, we were lucky to see the market in it’s current (post-1923) home: a move to a more modern facility that should have happened last November has been postponed. Cue local newspapers running “something fishy” headlines. We took a tour of the market with local food writer & guide, Atsushi, the Tsukiji King, and I’m very glad we did. 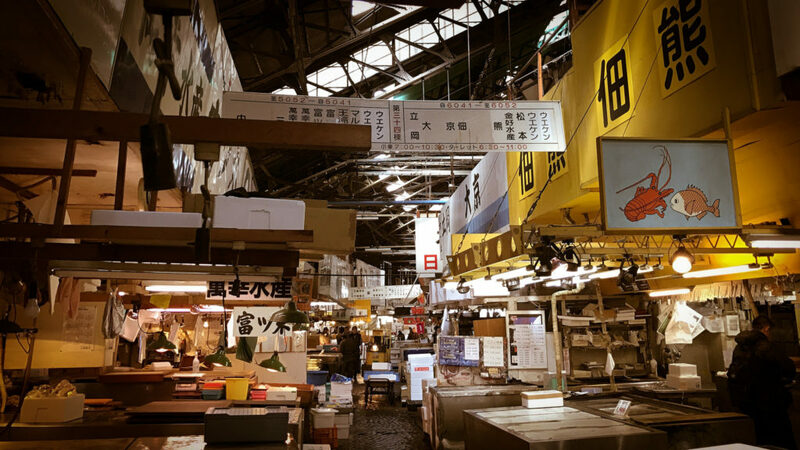 Tsukiji is a fully functioning fish market, complete with high-speed delivery vehicles & special band saws designed to chop huge chunks of frozen tuna. It’s not a place you’d particularly think to enter as a tourist so a guide proved especially welcome as I don’t think we would have wandered the warehouses alone. Atsushi showed us the inner & outer markets, explained the selling process and provided a guide to all the food paraphernalia that’s also for sale in shops around the area. I’m continually amazed by the pieces of plastic sushi that are mainly used by restaurants to show-off their ‘dishes’ in their windows. There was the added bonus of using an expert guide; he recommended the most amazing sushi place for lunch at the end of the tour: every piece hand-made in front of you from the very freshest ingredients. I thought I’d eaten good sushi before but now I know differently. The second part of my Japan 2017 Retrospective (pictures from Kyoto) will be uploaded tomorrow but you can review all the pictures right now in my Flickr Album. Sermon Of the Last Sunday is my attempt to ensure that there is something published on my site very month in 2017. You can read about my attempts to force myself to write or my first post of the season (which is another challenge) in which I decide read a book every month this year. The full #sols collection has a handy site tag, sols.